"There are signs that some super-rich are revolting against their "wealth fraternity." Last fall, mega-billionaire, Warren Buffet, traveled to Washington to meet with Democratic Senators and urge them to raise taxes on the wealthy like him. He pointedly said he pays at a lower rate than his secretary. [...] Earlier in this decade, he joined with a thousand other rich Americans led by lawyer William Gates, Sr. and Chuck Collins (founder of United For a Fair Economy) to successfully block the repeal of the estate tax (applied to 2% of wealthier decedents) by a Republican-controlled Congress. According to a Quinnipiac University poll in March, a solid majority of Americans favor raising taxes on those earning more than $250,000 a year. Megabillionaires in our country are encountering their peers here and around the world to commit fifty percent of their estates to 'good works.' They will grapple with the definition of 'good works' as to whether that means charity or justice. The difference is important. For example, soup kitchens are a necessary and human charity. Whereas justice goes to the causes of why rich economies have any hunger at all. 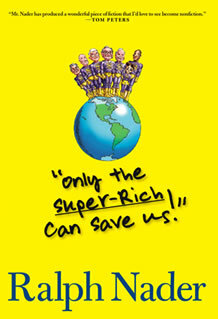 With some super-rich thinking about moving from soft philanthropy to advocacy, or to shifts of power, I hope my recent work of political imagination -- 'Only the Super-rich Can Save Us!' will spark their interest."